Enriching macular pigment throughout our lifetime is not only important to protect our macula and fovea from the oxidation stress that can lead to blindness later in life, it plays a very important role in vision optimization, even when we are young and healthy. When light enters our eye it is made up of all colors of the rainbow. The most important color for our central vision is green. This means that our photo-receptors called cones in the macula and fovea are most sensitive to green light. Blue light has the highest energy of all visible light that enters our eyes. However it is not important for our central vision but does play a role in our nighttime vision, color vision and it plays a significant role in our sleep/wake cycle…called our circadian rhythm. Since blue light has the highest energy of all visible light, it also causes the most damage of all visible light to our macula and fovea and it is responsible for visual disruption or blur in our everyday lives. Macular pigment when enriched not only quenches the free electrons responsible for damage due to oxidation but it also is a natural absorbed of blue light. 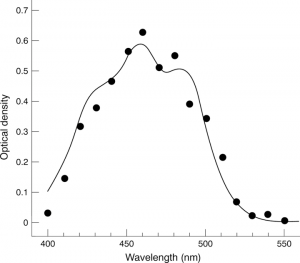 See below the absorption spectrum of macular pigment in the blue part of the visible spectrum. 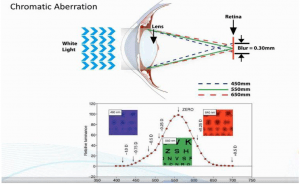 Blue light, not absorbed by macular pigment is out of focus. Our brain usually does a good job ignoring this blur but under certain conditions, like low light conditions or driving at night, this blur can be visually debilitating and presents itself as glare and poor contrast. When visible light enters the atmosphere from the sun, the blue light wavelengths bend and scatter more than the other colors. These scattered wavelengths of light hit the gas molecules in the atmosphere causing us to see the sky as blue. The same thing happens when blue light enters our eye. It scatters resulting in disability glare, visual discomfort and slows your recovery time from oncoming headlights (called photo-stress recovery time). Enriched macular pigment reduces disability glare and discomfort, and speeds photo-stress recovery time by absorbing intra-ocular scatter. Glare disability is even worse at night-time because under such conditions of glare, loss of contrast sensitivity is greater in dim than in bright light environments (e.g. strong oncoming headlights whilst driving at night) because our rods need greater contrast differences for target detection than do cones (approximately 20% vs. 1%, respectively). The photoreceptors (cones) in our macula and fovea are most sensitive to green light. Green light is in perfect focus on our retina when we have our best 20/20 vision. That means that the blue wavelengths of light are out of focus creating myopic blur (near sighted blur). This is called chromatic aberration. Chromatic aberration reduces our contrast resulting in our difficulty seeing under low light or on low contrast conditions. These conditions are especially apparent when trying to read a menu in a dimly lit restaurant, looking at grey letters on a white background or when a better is assessing the speed and spin of a baseball. Macular pigment absorbs this blue light and when maximized, even in normal healthy eyes, it will improve contrast and therefore can improve your visual performance and reaction time.